Preeminent Americana and bluegrass musician. Formed Hot Rize in 1978. 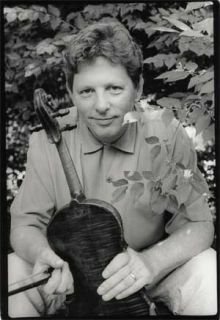 Hot Rize was the International Bluegrass Music Association's first Entertainer of the Year in 1990, and in 1993, O'Brien took the IBMA's Male Vocalist of the Year honors. O'Brien's first solo album, 1984s Hard Year Blues, reached beyond bluegrass into an original folk fusion that would define his solo career. Three subsequent releases of duets with his sister Mollie O'Brien showcased a love for antique country material, cowboy songs and Western swing. Following the breakup of Hot Rize, O'Brien assembled the O'Boys with jazz and bluegrass guitarist Scott Nygaard and bassist Mark Schatz, an eclectic band well suited to O'Briens original material. Their output included 1993's Oh Boy! O Boy! and Red on Blonde, an all Bob Dylan outing. Throughout the 1990s, O'Briens musical relationships flourished, and he became one of the most prolific collaborators in American roots music. In just his second meeting with emerging songwriter Darrell Scott, the pair wrote "When No Ones Around," which became the title cut of a critically acclaimed 1997 album by Garth Brooks. In 1999 and 2001, he collaborated with some of Irelands best musicians to create two striking collections of original and traditional songs. On The Crossing and Two Journeys, O'Brien explored his family roots in Ireland, the Irish-American experience and as the Appalachian/Celtic musical dynamic that underlies so much American traditional music. They were regarded by many as world music triumphs.